For many people the invite that they send for their wedding remains one of the first defining impressions of how their marriage party is going to be like. Many feel that if the invite is too plain one may think that it's going to be a pretty regular party and if on the other hand the invite is zany and ornate it suggests that the celebrations are going to be grand. 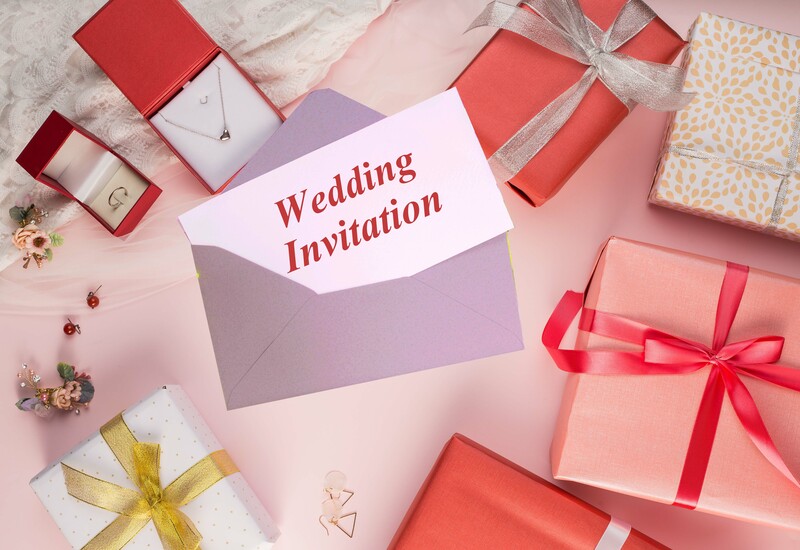 And while, one cannot totally deny that a wedding invite does sets the tone for things to come most wedding experts would suggest you not to overspend o this aspect. If the idea is to make that lasting impression, you can do that by adding cute little gestures that are more charming than any of those gold gilded expensive wedding invites. Depending upon the season of your wedding you can add little interesting touches to it. For instance for a summer wedding choose a card in soothing pastel hues and set a small bunch of wild summer potpourri with it. A pouch of lavender, a potli of mogra flowers all signal a summer wedding in the most romantic fashion. If monsoons are the time for you to tie the knot then how about a small box of kadak adrak tea bags to go with the invites. For winters choose a bag of marshmallows or coffee beans to be ground and savoured. We bet your guests will be quite kicked about attending the wedding. Just writing the names of the family members doesn't cut anymore how about adding a little note may be a handwritten line or two. Something like ... Dear Rimi, how's the new job going. I understand you must be busy with newer responsibilities but you have to take time out for my wedding. Or Dear Ajay, Hope you back from your holiday. I think you should recharge some more at my wedding celebrations on... This way you are taking a moment to make your guests feel special. There is no way that they are going to forget your sweet invite. Apart from the RSVP number how about adding another number to help your guests find their way in case they get lost or are unsure about the venue. From your side of family or friends ask someone who volunteers to answer the phone for any harried guests stuck somewhere and patiently give them direction. By adding a number saying for venue directions or any other queries regarding the ceremony call... You will make it easier for the guests not only to navigate their way but also to feel free to ask any other questions they may have before they attend their big day. If you have any gift policies it is best to let your guests know in advance. Also in such a case send out the invites in advance so that your guests can accommodate your choices. If you are opting for a charity then its best to give your guests a little background on the work the charity has done. Oct. 26, 2017, 5:02 a.m.